MILES MCGANN: Hello my name is Miles McGann. I'm the CEO Progressive Orthodontics. Today we are here with my good friend Willem Koelewijn from Holland. Willem is a longtime POS instructor and one of our original students in the Dutch class when we first expanded into Holland back in the early 90s. He's been teaching for us basically ever since, I believe. He runs a very large practice in Holland and has a lot of experience both in ortho as well as in every type of dentistry. I think we'll cover some interesting concepts, especially if you're into a large practice environment with lots of volume. So welcome Willem. Thank you for being here. So tell me a little bit about how you got started with POS? DR. WILLEM KOELEWIJN: Yes that's quite an interesting story. In the Netherlands we have the normal dental education as they have everywhere in the world, and they tell you about ortho, but they actually don't tell you about ortho. They try to keep it for themselves, more or less, that's my opinion. So I was living and working in a kind of a remote area where an orthodontist was not available and people have to send the children out to an orthodontist which was a one-way trip by bus for an hour and a half to have a visit for five minutes and come back for an hour and a half. So you see there was a lot of peer pressure on me to do it myself, but I didn't have the knowledge so I only did some removable appliances. It can't do a very good job so I didn't get satisfaction from it. I started looking for ways to make it work better. I started putting on some brackets in combination with removable appliances. Then I was looking at seminars but the courses in the Netherlands were not up to par. They let you go let's say on a Friday afternoon and you start at 2 o'clock, at 4 o'clock the instructors were gone and they keep you busy forever doing the same thing as you were doing as a student, so it didn't make any progress and I didn't want to go there. Then there was a course coming up, Progressive Orthodontics, in the Netherlands and I thought ok let's go there. 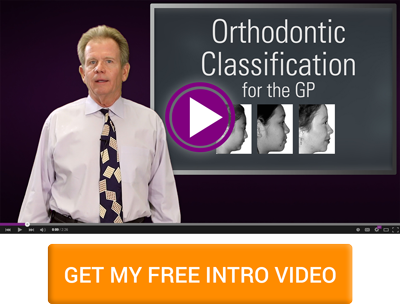 It was a three day course and I thought I could be an orthodontist in three days. Turned out to be something else but whatever. We tried. We went there and there was a tremendous amount of people, about 140 or something. Your dad was there and after two days he told so much that I was really convinced this was the way to go. I was there with a friend and we decided to take the next seminar too. MILES: So one of the classic stories that my dad's always told about you, going back to kind of this volume concept, he said at one of the early, early seminars you asked him to take a look at some of your cases. You went out to your car and you walked in with a suitcase full of cases, models and records. So you guys sat there and diagnosed all night long and he said at the end of it he's exhausted, it's 1 a.m. or something, can barely see straight, and you say so uh can we do this again tomorrow? And my dad is going how is this possible you have this many cases, but this was part of the Dutch system. DR. KOELEWIJN: Actually I was already kind of running an ortho practice, but I was doing it my way and that was the old-fashioned way with appliances, removable, partially fixed, you know trying to find a way and then your father came and he told us the things that the Dutch orthodontists didn't want us to know. Yeah so that's where it started. In 1994 we graduated and I changed my whole system. I threw all the old stuff away and recharged on the new one and from there it started to be POS. MILES: But the Dutch system, it's always been a volume-based system because it is more of an insurance base, so it's not a lot of money out of the patients pockets as long as they keep coming back to the dentist. The government or the insurance pays for their treatment and so because of that you've seen a lot of changes in the Dutch system over the years. I remember when you first started doing ortho, ortho fees were very high and then ever since that point the government has been constantly chipping away chipping away, chipping away, to now it's very low, but you've always been able to do high-volume. But you're one of the few dentists in Holland that I've known that said look, the government's going to do what it's going to do, tell me the rules I'll figure out a way. That’s always been your perspective right? DR. KOELEWIJN: Yeah, that's kind of my personality I think. My accountant always told me if you work less you don't have to pay less taxes. I say I'm not going to listen to the government to decide what I'm going to do. I'm going to do it and if I can avoid paying too much I will do that. You have your own way to go through life and especially I was and I'm still am in this kind of remote area where I provide a system and care for people. You also have in life like social obligations and stuff like that, it's not just being there and making as much money you can for yourself. I think you have some responsibilities to the society. They educated you kind of, and so you have to pay back in a way. MILES: So your practice size, how many chairs do you have these days? MILES: You have nine chairs and how many staff members? DR. KOELEWIJN: Altogether we're 25, but I have three other dentists working there. I am not working the whole week anymore but I still work three or even more than three days. MILES: So your practice style, do you do ortho on one day or do you do a mix? DR. KOELEWIJN: I have these nine chairs, three blocks of three chairs, and I do the ortho on Wednesday. Wednesday I start in the afternoon at two o'clock and I work till like 10:00 at night because Wednesday is the day that the schools have the afternoon off so it's easy. I try to go to schedules where the children don't have to skip school, so then they can come to our office. Maybe they have to wait a little bit because there is a high volume of patients, but they have Wi-Fi and they can read whatever. Wi-Fi is the solution for everything. They can watch their own videos and then they will be they will be served. So that's the Wednesday part. I think most of the time I see maybe 80 patients or something. MILES: 80 patients in an afternoon. So moving them fast. DR. KOELEWIJN: Yeah moving fast. MILES: So how much do you actually? What's your typical interaction with the patient during that time. How's your typical workflow in a high-volume practice like that? DR. KOELEWIJN: I have a dental nurse in every room and I'm going around. There is even one more extra that is bringing stuff in and out and cleaning and everything that is necessary. I'm, what your dad used to say, kind of doing ortho with my hands in my pockets. It's not actually true. I do some actual work too because sometimes, for example, you have a bracket error, it's not in the right place. I can make a long prescription for my dental nurse to put it on another way, right, but I see what I see, so I clip it off, they go to the lab, they sandblast it, or take a new one and I put it on the way that I want. And that I'm doing in like 18x25 wires. MILES: So there's a balancing act there. Some things are just faster for you to do yourself and other things are faster to have your assistants do for you. DR. KOELEWIJN: The bulk of the work is done by the assistants but I do the fine tuning. DR. KOELEWIJN: I don't know all the patients but it's like playing chess on several boards. MILES: So how many chairs are you working in on Wednesday afternoons? DR. KOELEWIJN: Three or four. MILES: Three or four, okay so three or four chairs, four assistants moving quickly from chair to chair. The comment, just for those of you who don't know, the hands in the pocket in ortho, one of the funny parts about it is sometimes the more you touch the it slower goes. So the concept that my father had was put your hands in your pockets so you're not tempted to touch the patient because every dentist wants to always touch the patient and sometimes you can do more harm than good by doing that. So that's the hands-off approach. Some appointments you definitely need to be touching the patient, but other appointments you're better off not doing it. So that's where that term comes from for those who haven't heard that term before. DR. KOELEWIJN: Yeah and you should not underestimate the possibilities of your employees. They can do things faster and better a lot of times. MILES: Absolutely. So one of the things that I've always really admired about you is you're willing to go anywhere and experience life in any country in the world. What's been the most interesting place and interesting group you've ever had the opportunity to teach? DR. KOELEWIJN: I remember Nepal. Talking to people and I think this is like planting a seed, you know, then it can grow from there. This is really the beginning of ortho in a country like that. MILES: One-hundred percent, because this was probably the first time we went through there, so that was maybe 10 years ago? DR. KOELEWIJN: No it's not that long ago. Maybe 6 or 7. I don't know exactly but that was a good impression. I like to go to Asian countries. They have a lot of questions, sometimes a little bit too much, even during coffee break. But if you understand everything then you can play with that a little bit and you still can satisfy them and motivate them. Motivating is one of the most important things in my volume practice and also what I'm doing in POS. MILES: Fantastic. Well thank you so much for all your time. It's been wonderful to see you again and again you know for all of you please tune in as we interview a few more. Thank you so much. DR. KOELEWIJN: It was my pleasure. Do you utilize your ortho assistants to see as many patients as possible like Dr. Koelewijn does? Share you experiences in the comments.